The Lobster Sports Elite Grand V limited edition portable tennis ball machine has many improved features, that makes its so cutting edge. You can customize its drill and programs in your own ways just like the elite grand V. But this one allows you to customize your own drills and programs more than eighteen different shoot locations. Imagine how many different things can be done with these options! You can set the shot location; ball feed rate, spin for each other shoot and so much more. You may not found any other match of this ball machine. On the review article, you will found all the details about the Lobster Sports Elite Grand V limited edition. So, take a look. All the important features about the Lobster Sports Elite Grand V limited edition portable tennis ball machine are given below. The pre-program drills of this ball machine are incredibly helpful. It allows you to work on a different kind of shots on the court. Besides, it allows some more like, program drills to customizing tennis play. It works on volleys at the net, overheads to gaining consistency on the game. The machine can through balls in 35 to maximum 80 mph speed. The greater ball speed and the minimal spin making the player move corner in and out of the court. That’s how they learn to adjust of attacking the balls. This will help them to develop their skills. If you are a beginner then starts with the lowest level of speed. Normally a beginner should start with 20 mph ball speed. On this case, the machine is best suitable for intermediate and the advanced players. Normally, the 80 mph speed is also huge challenging for a professional player. So the average and high level of tennis player easily challenge themselves with this hi-tech portable machine. This machine is very easy to move anywhere. When the hopper is inverted, the size of the machine looks like a suitcase. The machine is little heavy, around 44 lbs. But still it can lift by one man from the car trunk. Also, its oversize wheel allows you to move its anywhere you need. The elite V limited addition can perform continuously 4 to 8 hrs. If you use the regular charger then the charging period may long. On this case, use the premium charger. Customizable drill and programs, more than 18 shot locations. Pre- programmed drills- all courter, power baseliner, moonballer, grinder, slicer, lefty, forehand plus, attack/defend, approach, beginner, intermediate, advanced. 3 line function with 3 versatile position settings- wide, medium and narrow. Includes an additional 1 amp first charger. Oscillations- random horizontal, random vertical, fully random, horizontal & vertical. Ball speed- 35 to 80 mph. Ball feed rate- 2 to 9 seconds. Court time- 4 to 8 hrs. Optional accessories- 3 amp premium fast charger, storage cover, external battery pack 20 function consisting wireless grand remote control etc. Many customers share their experience after using this product. Let’s see some of their reviews about the Elite V limited edition tennis ball machine. Most advanced control panel for the menu, settings and control. Easily adjustable ball spin, feed rate, and speed etc. It takes huge time to fully charge. You can use the premium charger or external battery to increase the court time. In conclusion, this product could perform overall a good job as a portable tennis ball machine. It’s a huge option of pre-loaded and customizable drills will allow you to play the most advanced level of tennis. So if you want to play something unique, tough and adventitious then you can choose the Lobster Sports Elite V limited edition tennis ball machine. 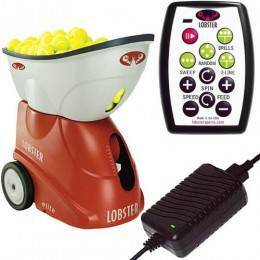 You can also read best lobster tennis ball machine buying guide and this post inform you about the major features of top lobster tennis ball machine. And also you can know from there about tennis ball machine’s ball feed speed, ball feed rate, battery power, charged hrs, ball load capacity, service warranty, etc. You can compare with them and chose a tennis ball machine that is best for you.